Home Page » Communication » News » We are BIM ready! Tiemme is BIM ready! Our products are now available on magicloud.com! BIM, acronym of Building Information Modeling, is the future of the building design. The BIM model contains in a dynamic way all the information about a specific work starting from the project, continuing with the construction and ending with its disposal. This information model of the work will be the unique reference for all the people involved in the different life cycle stages of the structure and it will concern different aspects: materials, structural calculations, energy performance, plants, costs, maintenance, etc. Why is Tiemme BIM ready? We always work side by side with our customers and professionals who choose every day to rely on a competent and reliable partner such as Tiemme. For this reason, we choose to further help them by making our 3d models available in formats that are compatible with the most common BIM applications. 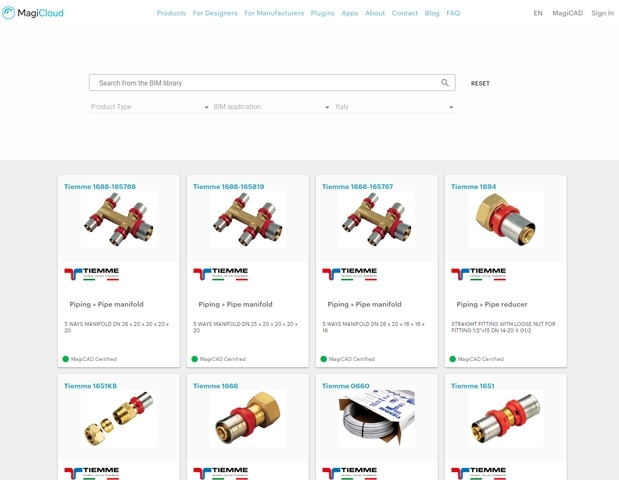 Many of our product families are already available on our portal and new components are added day by day.